Parker Millsap is from Purcell, Oklahoma and with his 24 years old releasing his fourth record. He is working hard at finding his own voice and style and working outside of the mainstream record labels has allowed him to just do just that at a fine pace. For me it's like I'm transported back about 40 years in time and listening to a Rod Stewart or The Faces record for the first time, say 'Foot Loose And Fancy Free' (1977). Millsap has a softer voice than Stewart but comes at least half of the way. There are some dirty rocking songs involved where a Ron Wood like slide guitar plays a role in. Clean ballads can be found as well, but no hit like 'You're In My Heart' was or, the opposite 'Hot Legs'. The main difference is that Millsap has a violin player who plays a role in each song. This fact makes Other Arrangements an album that sounds differently from most rock albums. It makes it stand out, in fact. Listening to Other Arrangements by the song, the variation between the songs is one of the first features that capture my attention. Parker Millsap is not afraid to change the mood on his album. Exuberant can turn into reflection within a song, 'Let A Little Light In'. Followed by the blues of 'Tell Me'. Somewhere beneath this all is a love for acoustic folk songs. Sometimes even as if the acoustic was stripped away in favour of his more rocking side. 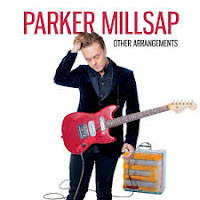 Parker Millsap is not afraid to add some less obvious influences into his music. Some Tamla/Motown can be heard in there, perhaps even a hint at gospel. The purpose of the record remains to rock at some level and the mix blends well in most songs. There's not much wrong with a soul choir accompanied by a mean lead electric guitar underneath it all. If I have to write something not speaking in favour of Other Arrangements it has to be that most songs colour neatly between the lines of rock conventions. Even when Millsap tips his hat to The Rolling Stones things never get really wild. This fact makes it hard for me to get through the whole album in one go. Despite the variations. Here I point back to Rod Stewart, I always had the same problem with him, even in his golden years, 1975-1978. Having said that, there is enough to enjoy on Other Arrangements. Parker Millsap knows how to write a good pop-rock song and has a clear vision on how he wants them to sound. The result is a varied, solid album showing him the way in which he may want to develop himself further.